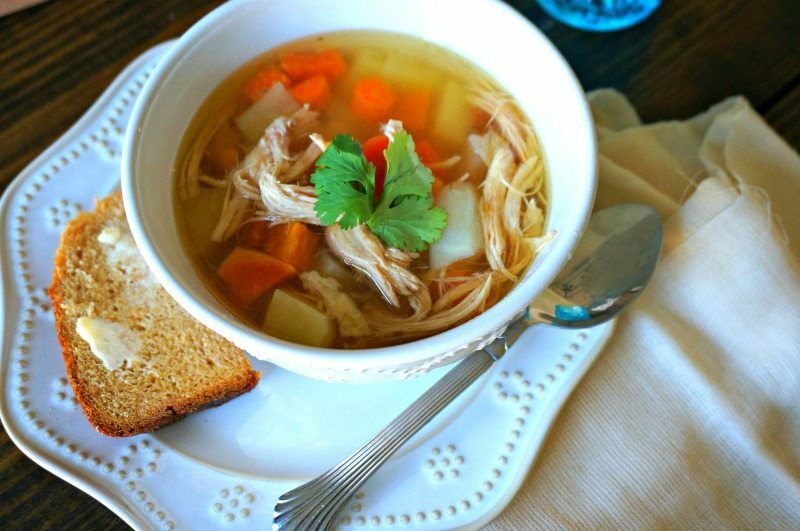 Healing Chicken Soup: A soup that packs a punch right in the face of illnesses due being loaded with antioxidants and immune-boosting properties. Not to mention the most comforting bowl of soup you have ever had. I woke up with a cold 3 days before my a trip that I had planned for over a year. I was taking my mom and daughter to Disney for my daughter’s 8th birthday. Many of you may be thinking, well, at least it was just a cold. Yes, but I have Cystic Fibrosis, so a cold for me is often so much more than that. Regardless, no one really wants to be sick in the most magical place on earth. Truth be told, I was hoping some of that magic would magically take away my sore throat, headache, cough, and congestion. But I could not wait for that magic. I needed to drop to my knees and ask God to extend his grace and healing on me and whip up a batch of homemade chicken soup, because my Healing Chicken Soup always seems to have some serious healing powers. My Homemade Chicken Soup is not like any other chicken soup you have had. It is your like your Grandma’s recipe stepped up a notch. It is still prepared slowly and love is poured out into it. But the broth is flavored with more than just celery and onions. There is a garlic, ginger, himilayan salt, and fresh lemons–all of which are known to combat illnesses. It is rounded out with carrots, potatoes and sweet potatoes to make it hearty and filling. But I have several secrets that I am about to share with you on what truly makes this chicken soup stand out. First, I start with a whole chicken. I do not like much skin on my chicken, so I pull off as much as I can while the chicken is raw. It is your call if you want the skin on or off. I recommend off for a less greasy broth, but bones in for rich flavor and the nutrional benefit of bone broth. Seondly, I add in a bit of soy sauce for depth of flavor that can not be topped. If you are Paleo, use Coconut Amino Acids–that works wonders as well. I also add in half of a fresh jalapeno with the seeds removed for with the potatoes and carrots. That may sound crazy, but trust me, that bit of heat helps to clear out the sinuses quite well, but yet it is still mild enough for sensitive tummies and because I fish out the piece–no little bits of green to scare off the kids! Finally, finish the soup with a squeeze of fresh lemon. Just a bit of that fresh flavor really lets the soup sing. 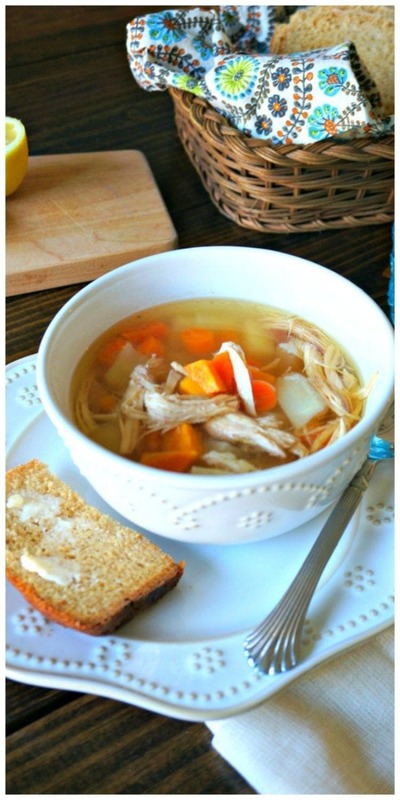 It is the best chicken soup around–so good in fact you may hope to get sick just so you can have an excuse to make it. Okay, let’s not make excuses, just eat and enoy this soup, sick or healthy!! 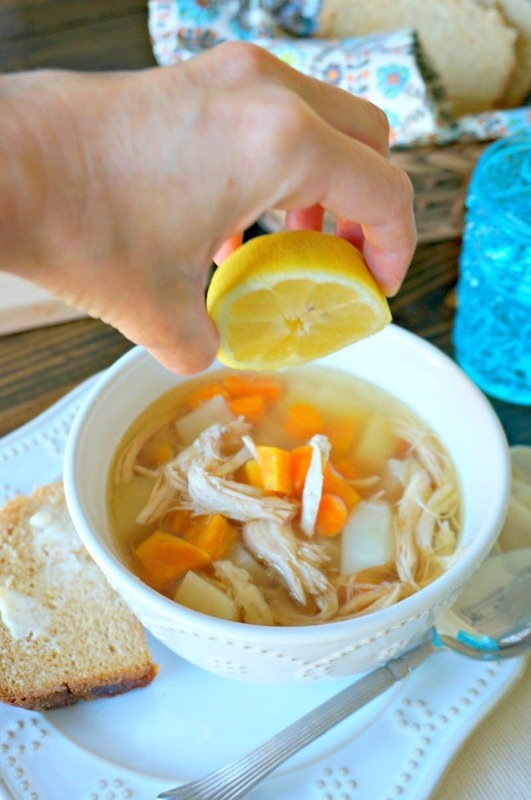 A rich chicken soup filled with potatoes, sweet potatoes, and carrots and made with citrus, garlic and ginger for an antioxidant rich soup. 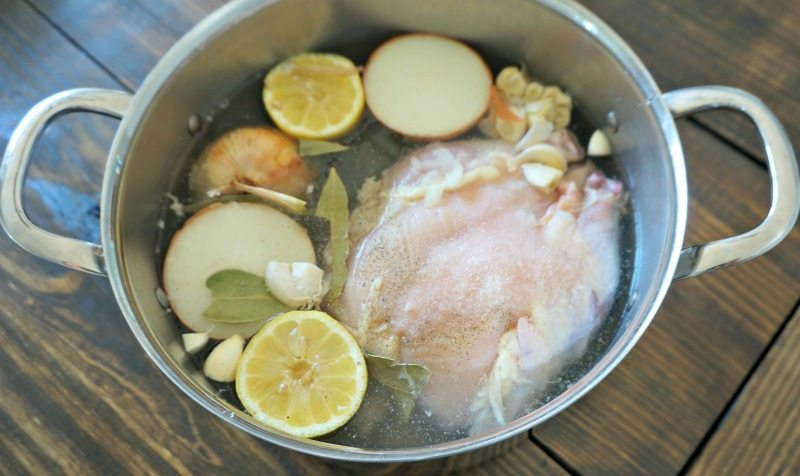 Place chicken, onions, garlic, ginger, bay leaves, salt, and pepper in large stock pot. Cover with fresh water. Bring to a boil. Reduce heat and let simmer for at least 5 hours, up to 8 hours. Remove chicken to a cutting board and strain out ginger, onion, garlic, bay leaves and lemon, leaving remaining broth simmering. 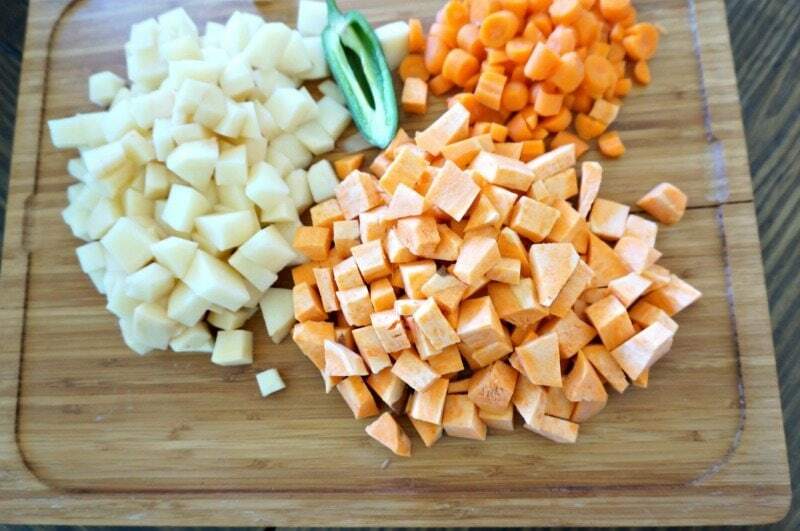 Add in potatoes, carrots, jalapeno, and soy sauce and cook until vegetables are tender. About 20-30 minutes. Shred chicken meat and add back into soup, cooking until just heated through. Squeeze with the juice of fresh lemon and serve. Be sure if you need this soup to be gluten free that you your soy sauce is gluten free. *Note: I prefer to fill this soup with veggies and serve with a freshly baked bread. If you would like to add noodles, whole wheat egg noodles added at the end of the cooking process work great. **This soup also freezes well and is great to keep on hand for days you don’t feel well or need a warming meal. Just allow soup to cool completely and the freeze in freezer safe containers for up to 2-3 months. By the way–we had a great time in Disney–and I didn’t end up with an infection from my cold. That is magical in my book for sure! Chicken soup is the best comfort soup. Oh man, I am so sorry for you Katie–it is NOT fun to be sick on ANY vacation. Bookmarking this for when my family will (inevitably) need it this fall/winter. With school back in session I am always waiting for my son to come with something. Oh I hear you Allison! As soon as school starts, the sniffling begins. Hopefully you can avoid it! 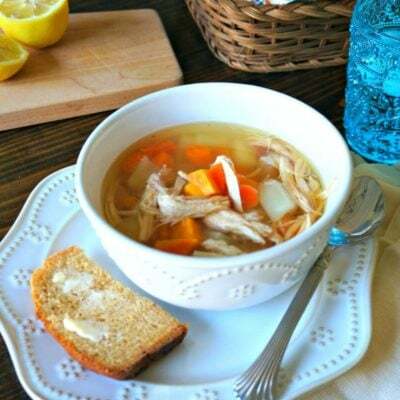 It’s crazy that a ‘soup’ can do so much, but chicken soup is really a miracle elixir! I love your addition of ginger and pepper! I can already feel my sinuses clearing! Yum! This soup sounds amazing. I love the addition of soy sauce and sweet potatoes! Can’t wait to try this recipe. I will be sharing a link to your recipe in my upcoming post, Easy Healthy Lunch Ideas (on a Budget). I am sure my readers will love your recipe too! Thank you so much Tina!! The soy sauce and sweet potatoes are a great addition for sure!